Pikachu and ten other Pokemon are Japan's official mascots the 2014 World Cup in Rio. I bet Domo and Hello Kitty are kicking themselves right now. I am well aware that Japan has plenty of other colorful cultural icons that would have done just as good a job of representing the country in the World Cup this year. Characters like... um. Cloud? That little fluffy thing? A tentacle? Whatever, I'll ask Kotaku East master Brian Ashcraft about it later. 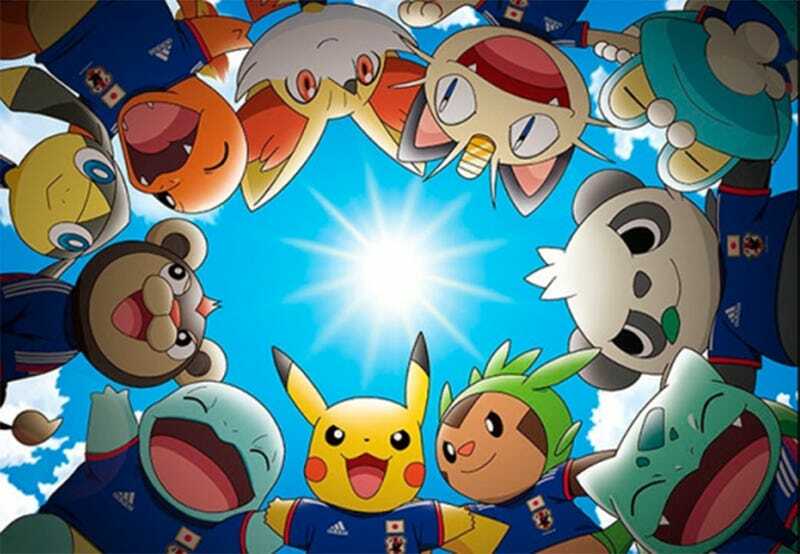 What matters now is Pikachu is the official mascot of Japan's World Cup team, and he's bringing Squirtle, Bulbasaur, Charmander, Chespin, Froakie, Fennekin, Meowth, Pancham, Litleo and the one I can't remember and can't be bothered to look up with him. Why? Look at the little bastards. They are adorable. Who could possibly score a goal on a team fronted by these little guys? That's why. Oh, and Adidas is handling Japan's livery (not the right term) for the trip to Brazil in June, and they entered into an agreement with Nintendo. This is sort of like a Stick Jockey segment, isn't it? Hooray for sports!